Pecans are tree nuts originating from a large deciduous tree. The pecan tree is native to Mexico and North America. Americans are used to pecan consumption, especially the popular pecan pie. Beside pecan pie that we all tend to love, pecans are very healthy and should be consumed during the entire year. Pecans are a healthy snack for you, but you can add them to a meal as well. There are plenty of dish recipes which include pecan nuts as well. Are pecans good for health? Yes, definitely, pecans are very healthy and tasty as well. Pecans are considered as healthy nuts because they contain monosaturated fats such as phenolic antioxidants and oleic acid. 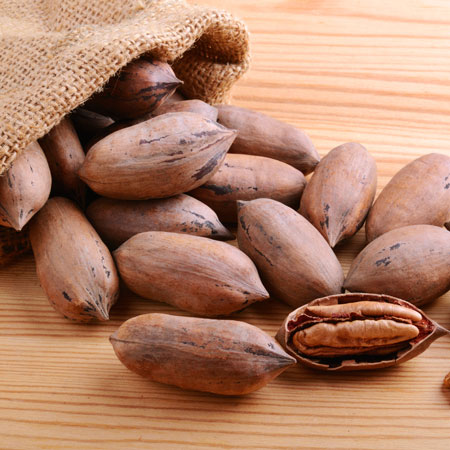 Pecan consumption will lower the level of LDL cholesterol, also known as bad cholesterol, but it will also increase the level of HDL cholesterol, also known as the good cholesterol. This will help prevent cardiovascular diseases and stroke. Pecans are packed with fiber which of course will promote a better health of the digestive system, regulating the bowel movements. If pecans are consumed regularly they will prevent constipation, reducing the risk of colitis and hemorrhoids as well. Because pecans are rich in magnesium, they have anti-inflammatory properties. When the levels of magnesium are increased, the inflammatory process in the body will be reduced. Pecans can help in these cases, reducing even the risk for various health conditions such as cardiovascular diseases, arthritis, Alzheimer’s disease, etc. Are pecans good for you? Pecans can even reduce the risk of cancer when consumed regularly, because of anti-proliferative properties they have. Oleic acid found in pecans is known to reduce the risk of breast cancer for example. The risk of colon cancer is also reduced because pecans promote digestion and overall a better health of the gastrointestinal system. Pecans are packed in fiber and other necessary nutrients. Because they regulate the digestion and bowel movement, pecans can help you lose body weight and maintain a balanced body weight. They also enhance satiety. Pecans are great for snacking. If you are looking for a healthy snack on the go or to keep you going during the day then pecans are a great option. Pecans are also very rich in different vitamins and minerals. Pecans because of their anti - oxidant properties prevent wrinkles, fine lines, and skin pigmentation. They are packed with vitamin A, vitamin E, ellagic acid, etc. Pecans are packed with magnesium. This mineral is a great antioxidant which will, of course, boost your immunity and prevent you from various health conditions. So are pecans good for you? Yes. Pecans are healthy nuts packed with vitamin B complex, vitamin A, vitamin E, folate, phosphorus, calcium, magnesium, zinc, etc., which all play an important role on the health of your skin and hair. If you want to have a glowing skin and healthy hair then eat pecans. Pecans are known for many health benefits. Because of their antioxidant properties, anti-inflammatory properties and because they are packed with vitamins and minerals as well, they can help prevent various skin problems. L-arginine is necessary for healthy hair and pecans are a great source of it. This amino acid promotes blood supply to the scalp, increasing the flexibility of the artery walls as well. The more blood the hair follicles get, the healthier the hair will be. Because these nuts are packed with various vitamins and minerals, including iron, hair loss can be prevented. Pecans can’t cure hypertension, but because of the magnesium they contain, these nuts can help lower the blood pressure. Are pecans good for you? Pecans are packed with calcium and phosphorus, both important minerals for bone and teeth health. Also, these two minerals are needed for cell growth and repair as well. Phosphorus prevents muscle pain that follows physical exercise. People often seek to buy deshelled pecans as it is easier than to remove the pecan shelf. However, pecans that are still in their shells are the healthiest ones compared to deshelled ones. You just need to learn how to remove their shell properly. Select only pecans that are uniform in size and that feel heavy. Pecans are delicious and tasty. A good thing is that they don’t need to be cooked before. You can toast the pecans for about 5 minutes in the oven by baking them on a baking sheet. Don’t forget to preheat the oven to 350 degrees Fahrenheit. Watch the pecans carefully as they are easily scorched. A pecan allergy is perhaps the most common and potentially serious side effect, just like with almost any type of nuts. The first signs and symptoms of a pecan allergy start to appear about one hour after consuming them. The severity of the allergic reaction can vary from mild to moderate and even severe and life threatening anaphylaxis. If you suspect of a pecan allergy, you should immediately stop eating them and consult a medical professional immediately.